Only One Available! This Wall Shelf is made from 4/4 Exotic Zebrawood with 8/4 Tiger Maple risers. The combination of these woods results in a very distinctive and eye catching piece. The shelf is 35" Long x 7" Deep x 9" High. A plate rail has been added to the top of the shelf for those special pieces you may want to set up for display. The risers are on 16" centers so the piece can be mounted to studs for those very heavy pieces you may want to display. All joints were compression glued and pocket screws were added for strength and rigidity. The combination of the zebra stripes and tiger flames makes for a very distinct and unique piece. The shelf was designed to be hung either by hidden rods or metal hooks which are provided by the buyer. Brackets can be added if requested for an added cost depending upon the option selected. All surfaces were hand sanded and 7-8 coats of satin finish lacquer was applied. The piece is bubble wrapped with multiple layers of cardboard protection and shipped in a carton. Zebrawood is imported from central Africa, (Gabon, Cameroon, and Congo). 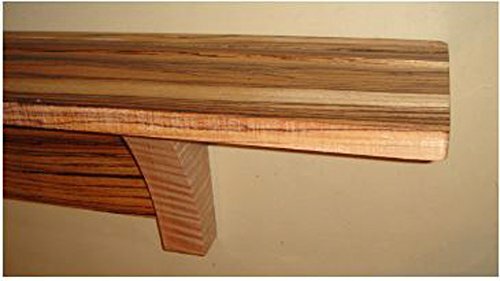 The heartwood is a pale golden yellow, distinct from the very pale color of the sapwood and features narrow streaks of dark brown to black. It is almost always quarter sawn to get the exciting alternating color pattern. It is a rare and exotic wood, used in a limited way for veneer, wall paneling, custom furniture, furniture trim, inlay bandings, parquetry, specialty items and turnery. It is also sometimes seen as stocks of handguns or in exotic guitars. In the past, it was used in Cadillac and Mercedes-Benz automobiles. Tiger maple also known as curly or flamed maple, ripple maple or fiddle back, is a feature of maple in which the growth of the wood fibers is distorted in an undulating chatoyant pattern, producing wavy lines known as "flames". mr² Woodworking also creates custom indoor and outdoor furniture, benches, cabinets and specialty wood items.